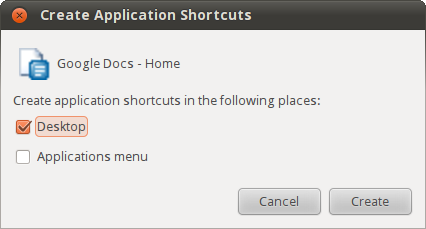 Application shortcuts enable you to quickly open web applications (like Google Docs) or apps that you've installed from the Chrome Web Store without starting Chromium, by creating shortcuts for them, just like you would a desktop application. Actually, you're still using Chromium with those apps. 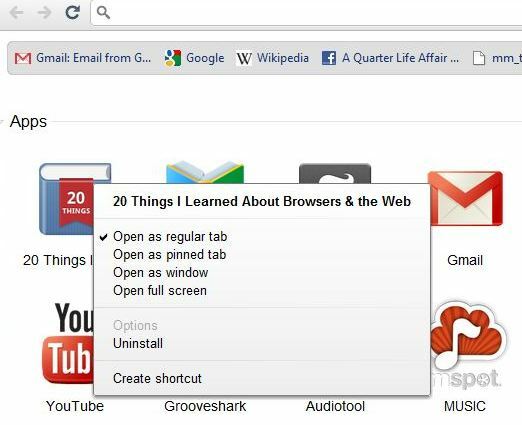 By using application shortcuts, however, you're eliminating all the distractions that exist in the browser window like tabs, the Omnibox, bookmark bars, and menus. Why do that? It's easier to use a shortcut than to fire up a browser, click a bookmark or type a URL, and then log into the web application. Let's take a look at how to create application shortcuts. In Chromium, go to the URL of the web application for which you want to create the shortcut -- for example, http://docs.google.com. Click the Wrench icon, select Tools, and then select Create Application Shortcuts. On the Create application shortcuts dialog box, choose to create the app shortcut on your Desktop, in your Start menu (Windows OS), in the Application menu (other operating systems), or all of the above. On the New Tab page, go to the desired app and right-click, then select Create shortcut. On the Create application shortcuts dialog box, click on the option boxes to create the app shortcut on your Desktop, Start menu, and/or pin the shortcut to the Taskbar. Then, click on Create.